Smooth operation, easy opening, and many options! 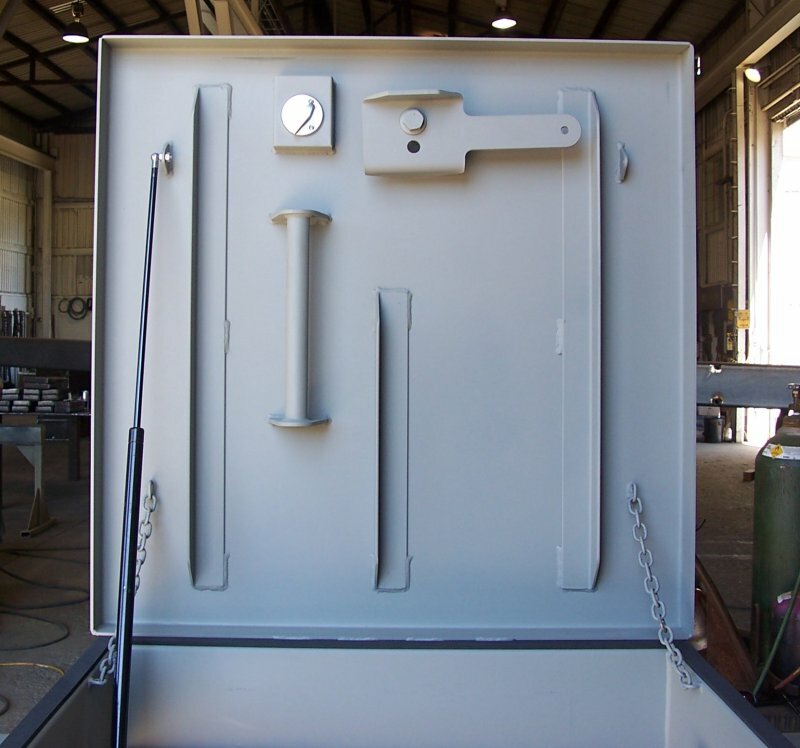 We use the same heavy duty hinges and latches as we do on our engineered blast doors. 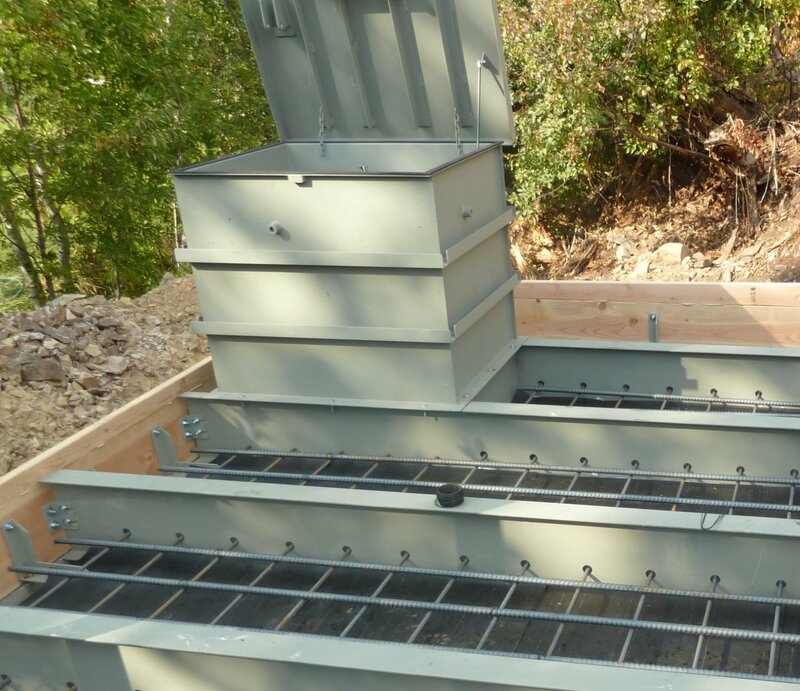 The riser hatches shown above feature external ribs that strengthen the frame to resist the compacted earth that gets backfilled over an underground shelter. We've placed many of these hatches in high security installations - military bases, nuclear power plants, and secure industrial applications. 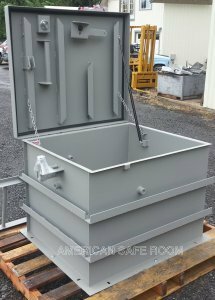 The hatches shown above all feature a 3/8" thick steel lid, heavy duty rotating cam latches, and a commercial deadbolt lock that is mounted under a steel pipe cap. Our engineering department has developed the optimal hinge and lift strut geometry to make heavy lids easy to open and close. 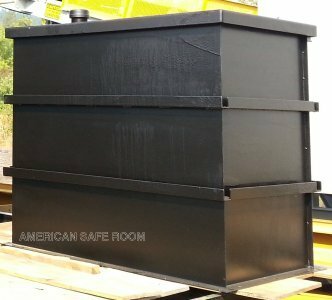 This is one of the fully insulated roof access hatches we designed and built for a secure facility operated by the US Navy. 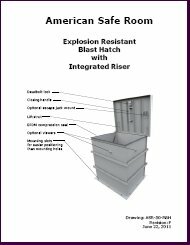 We did complete blast pressure calculations for it - lid blast load, lid rebound response, side blast load on the frame, and anchorage to the roof structure. 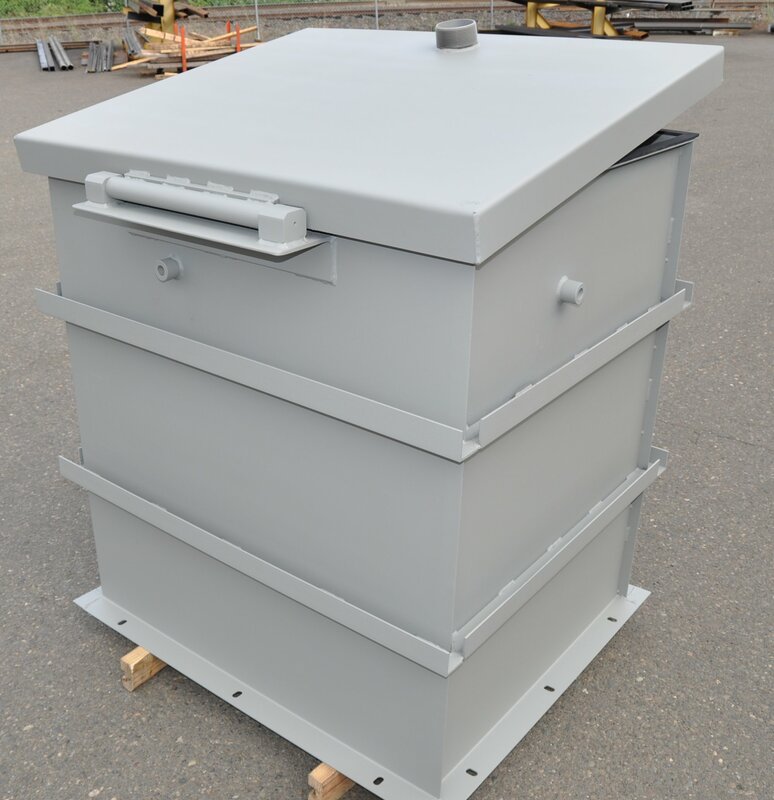 We use high temperature ceramic insulation under steel shrouds on both the lid and frame. These shrouds are given a 100% seal weld to keep out moisture and inhibit corrosion. 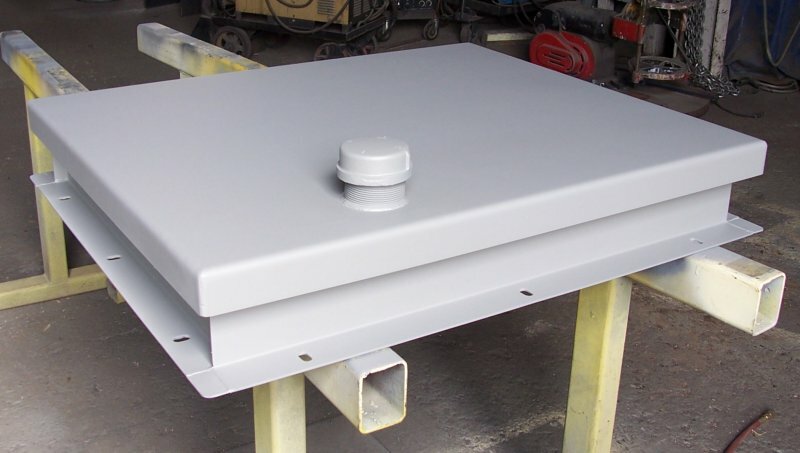 This hatch was finished with an organic zinc-rich surface coating containing 95% metallic zinc by weight. This special primer passed a 3,000 hour salt spray test and a 9 year subtropical test without failure. We've supplied doors and hatches to critical infrastructure in both Florida and Guam with this finish. 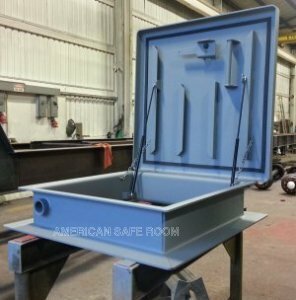 American Safe Room manufactures this riser blast hatch designed to be installed on an underground shelter. It features an integrated riser that can be ordered in custom heights to match the backfill depth of the shelter. 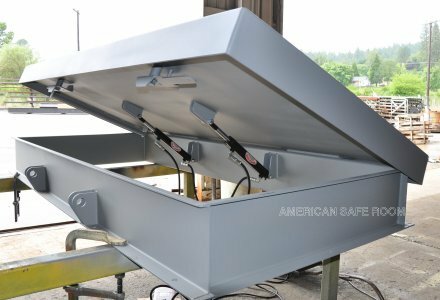 It is designed to be bolted down onto the top of concrete shelter with concrete wedge anchors or it can be poured in place. Another option is to weld it to a steel shelter. The gas spring assists opening. Options include a wide angle viewer on each side, an emergency escape jack, an internal ladder, an external ladder, and a deadbolt lock that is mounted under a pipe cap. It features plasma cut mounting slots instead of round holes to allow movement in two directions for easy positioning on the wedge anchors. The generous die-formed rain lip and closed cell EPDM seal keep water out! Our flat hatch is built just like the riser hatch, but the standard frame height is 6.75 inches. The viewer option will increase the frame height by 6 inches to allow easy viewing. On flat hatches, the escape jack has a bottom mount that needs to bolt onto a wall under the hinge side of the hatch. The inner rotating cam latch is the same one we use on our blast doors. It draws the blast lid downward, compressing the EPDM seal on the frame lip and drawing the rain lip down over the riser. Shown is the inside of a riser hatch with the deadbolt operator next to the cam latch. Note the lift strut on the left side with a duplicate strut anchors welded onto the right side so you can install it on whichever side is most convenient. This is an early model hatch that had the closed cell EPDM seal mounted on the frame lip. 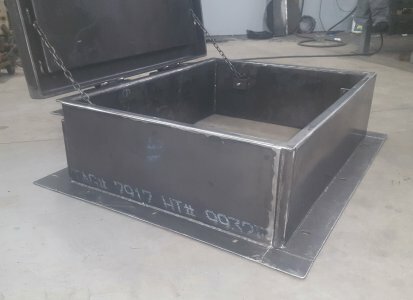 We've since moved it to the underside of the blast lid where it's protected by the rain lip and not subject to wear and tear as you go in and out of the hatch! The massive hinge assembly is the same one used on our blast doors. It features an inch and half steel pin, bronze bushings, and grease fittings for ongoing lubrication. 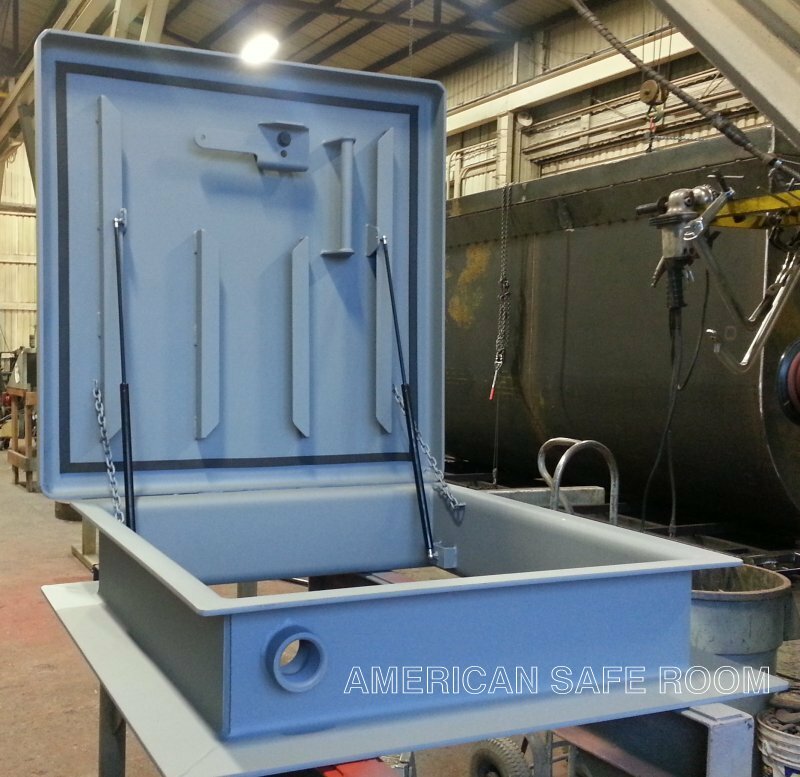 This picture shows the back of a riser blast hatch. The optional wide angle viewer port on the back side is just under the hinge. The rain lip on the blast lid is just showing the EPDM synthetic rubber seal and the deadbolt cap is has been removed off of the lock port. 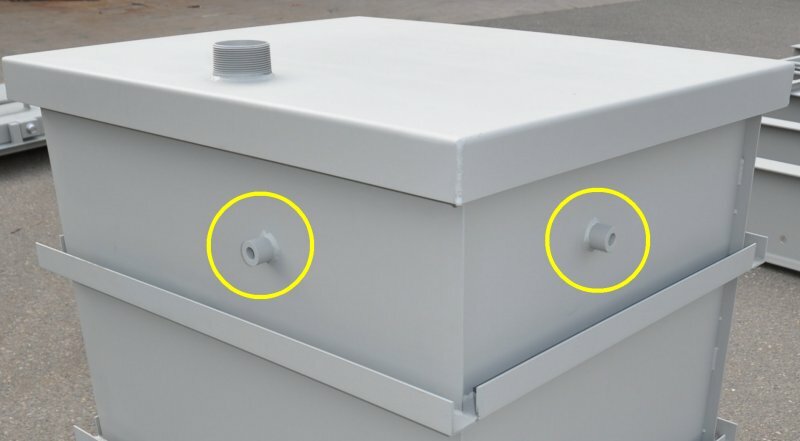 Note that on all of our current hatches, we've moved the seal to the underside of the lid. This keeps it out of the way as you are climbing in and out. 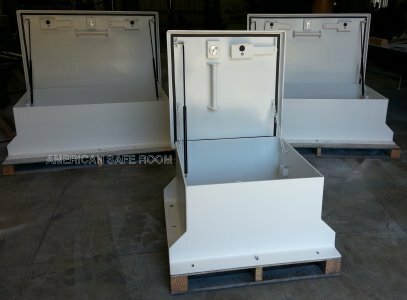 Both the flat and riser hatches can be supplied with optional UL fire rated wide angle viewer strategically mounted on each of the four walls. They are mounted six inches below the hatch. This gives you the ability to see what is directly around your hatch before opening it. The viewers are mounted in heavy duty inch and a half round steel rods that have been bored out, leaving three-eighths wall thickness. These mounts are inserted through the side wall of the riser and welded in place. 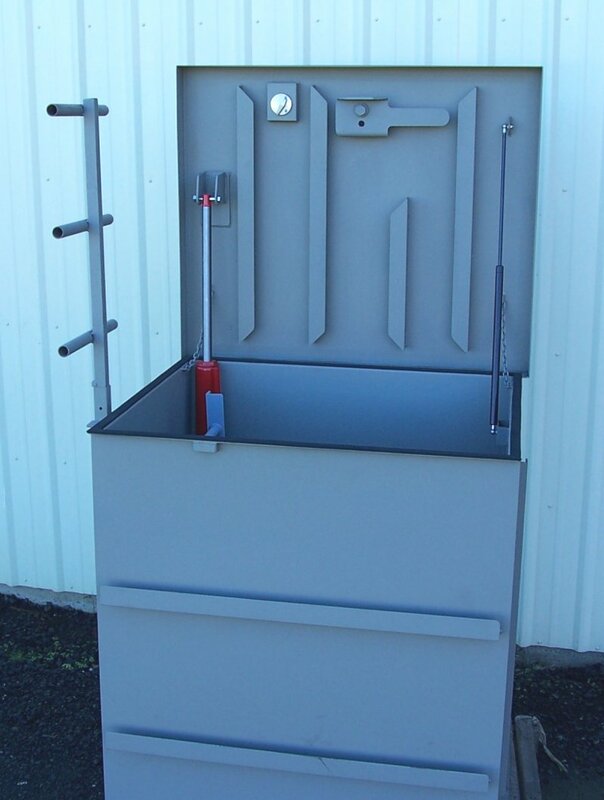 This optional 3 ton bottle jack can be deployed if debris falls on top of your hatch. In the stowed position, the top anchor is removed and it rotates down to nest behind the internal ladder. It must be rotated up into position before use - but you do not have to climb a ladder with a heavy bottle jack to affect emergency egress. The red jack is shown here in the deployed, extended position. 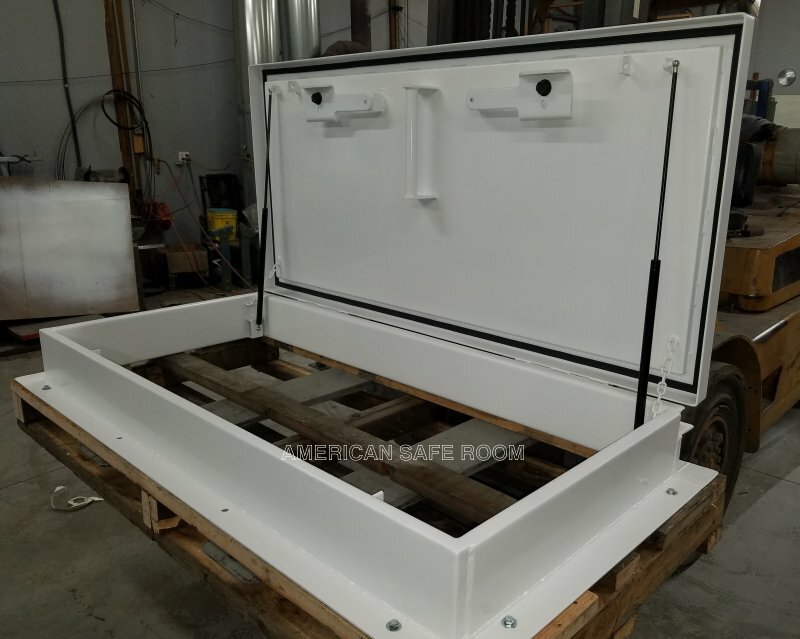 The riser hatch may be ordered with a bolt on ladder assembly - shown above next to the jack. This heavy duty steel ladder is rated for 300 pounds. 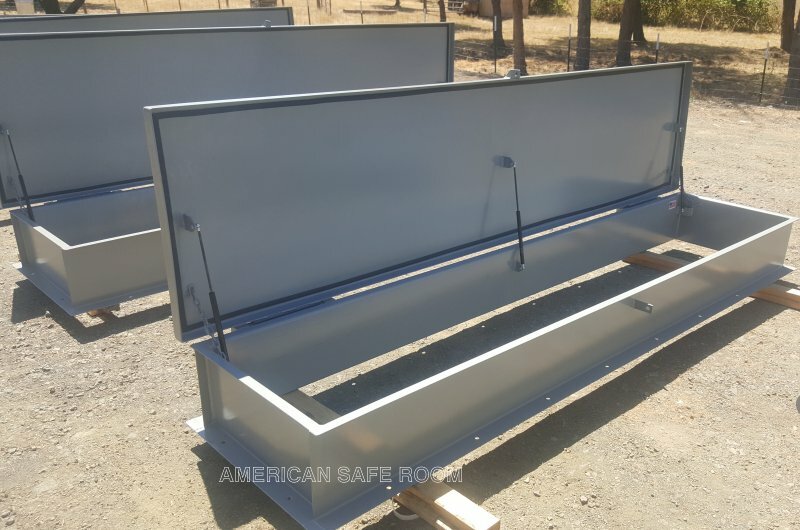 It is built to order, so it fits your shelter with the proper dimensions - the bottom rung is between 6 and 12 inches off the floor, the top rung is 6 inches from the top of the riser, and all the rungs in between are 12 inches apart with the proper toe clearance from the wall. See page five of the manual for ordering details. 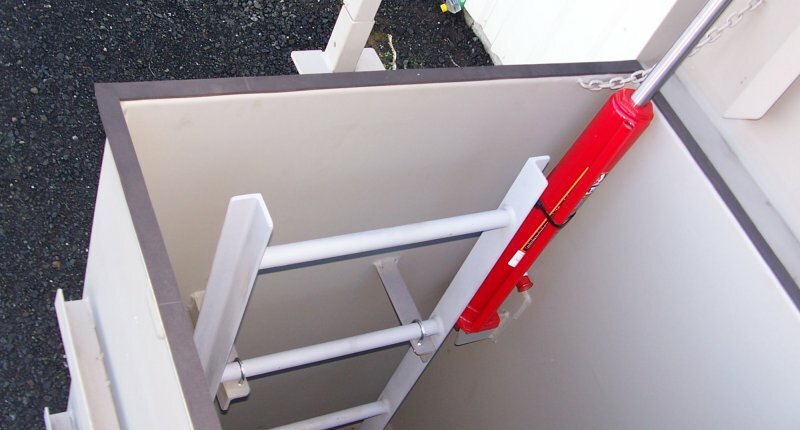 The riser hatch can be ordered with an optional removable above ground extension ladder for assistance and added safety for personnel entering or exiting the shelter. It fits into a socket welded onto the outside of the riser and is retained by a pin on a lanyard. It is lightweight and can be stowed inside the shelter and installed before climbing out. 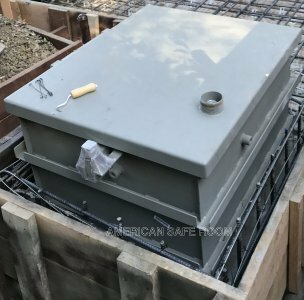 The riser hatch can also be installed on the bottom form board of a concrete shelter before the roof is poured. 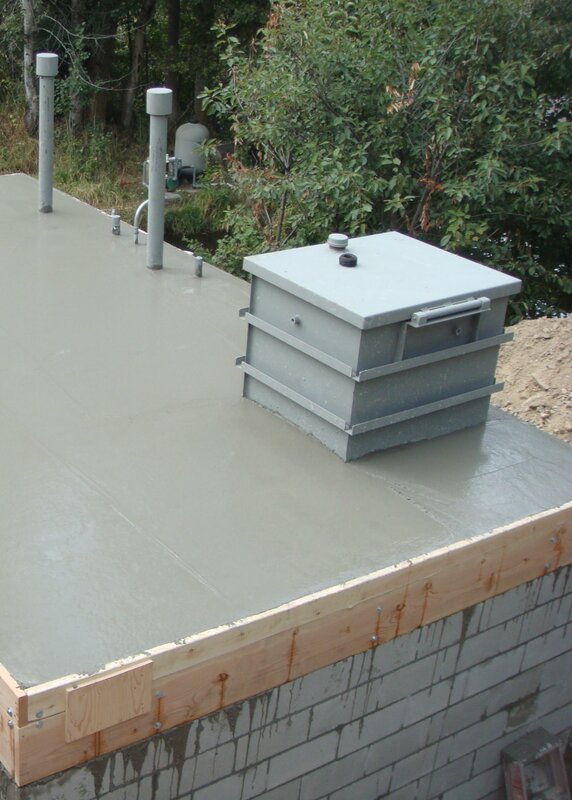 The concrete is poured around the hatch, sealing it in place. Note that the ventilation pipes are also poured in place. This installation ensures a good seal between the hatch and the roof of the shelter. 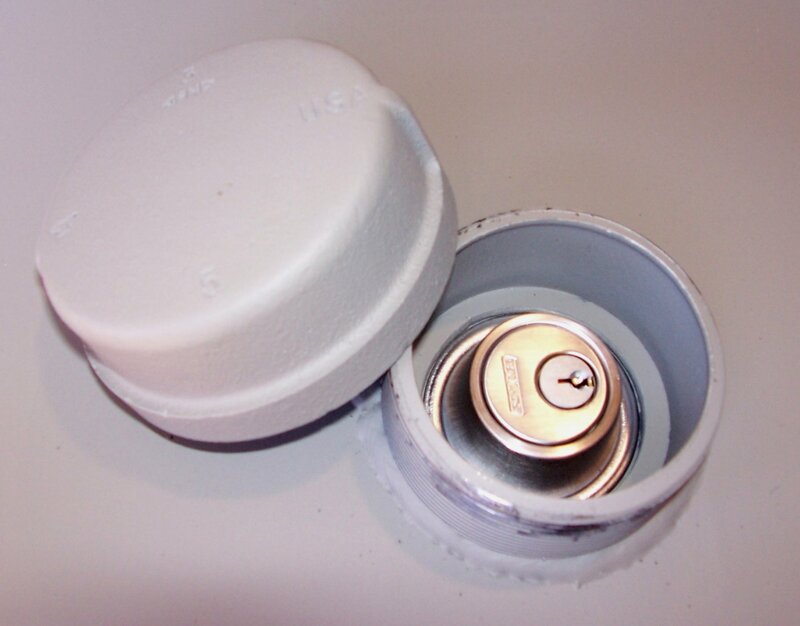 It also anchors the hatch in place to better resist nearby detonations or malicious people. 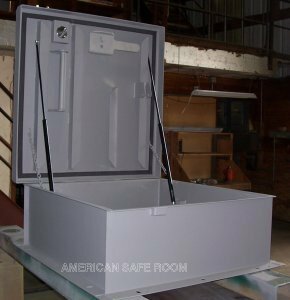 This 36 x 36 inch roof hatch was built for a high security facility. They omitted the deadbolt lock and had us weld a pipe coupler in the curb for an electrical feed. With a pair of properly sized gas springs, we can keep the opening force very reasonable with up to a 130 pound lid. The rotating cam latch is engineer rated for nearly 15,000 pounds and the hinge assembly is certified for 60,000 pounds. 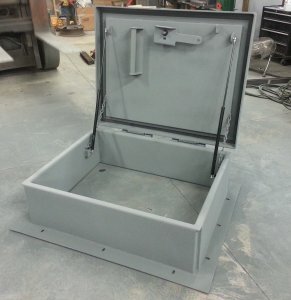 These hatches feature our normal heavy duty blast door hardware but are constructed of 3/8 inch ballistic steel - both the lid and the curb (frame). This will stop 7.62 NATO ball ammunition! 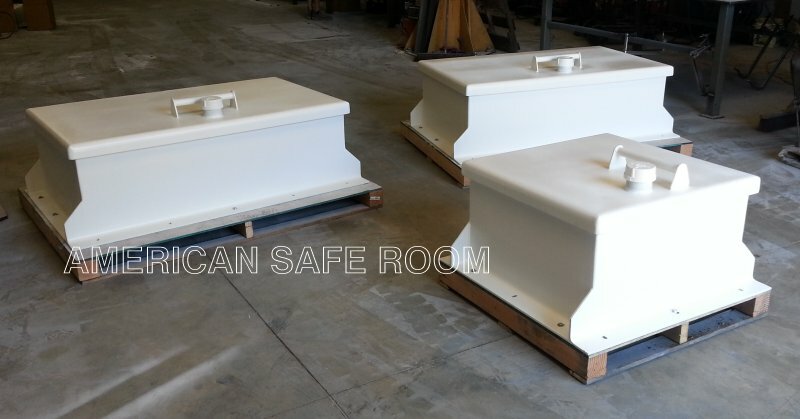 These are three ballistic roof hatches we designed and fabricated for an offshore nuclear power plant. 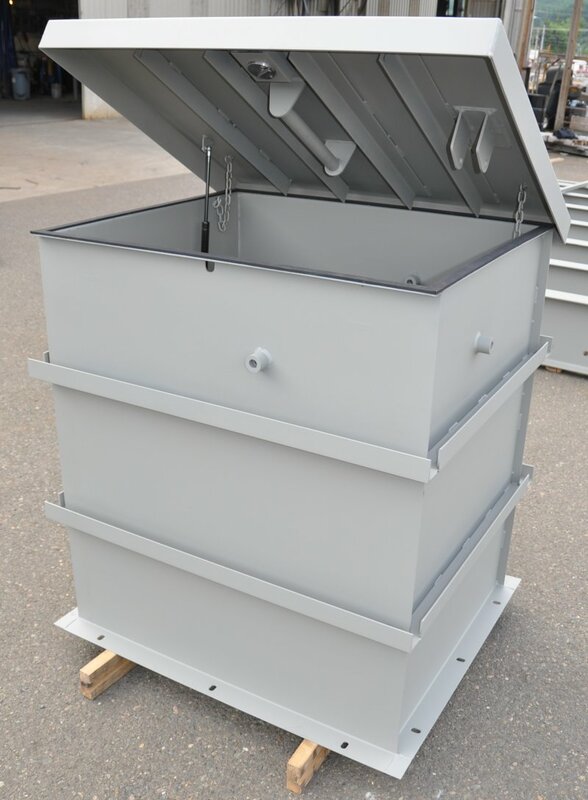 The flared front and back panels on the curb add structure to the mounting flange. 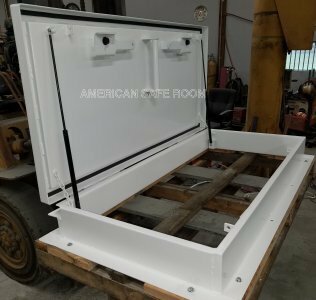 The customer specified a white reflective topcoat of paint due to the high temperatures of the region they are installed in. This customer also wanted a highly reflective white topcoat finish on their 30 x 66 inch roof access hatch. 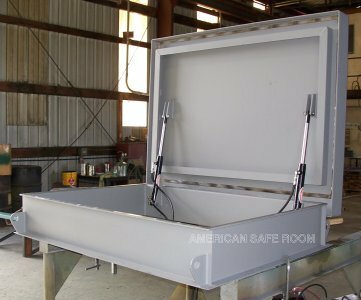 We supplied this hatch with a set of UFC-03-340-02 blast load calculations that included curb strength and anchorage to the roof. Note the raised panel on the underside of the lid. This is a fully insulated hatch. 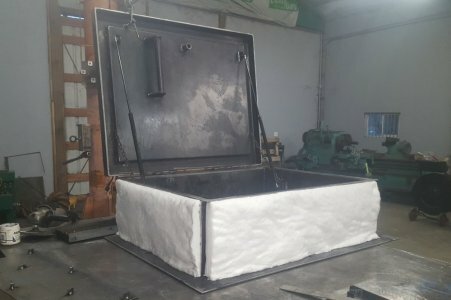 Both lid and curb have an inch and a half of ceramic insulation under steel shrouds. 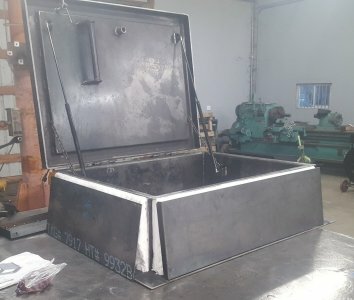 These are eight long hatches we designed and fabricated for a major municipalities' water department. They will cover a series of valves to provide protection and access control. This customer only required a hasp on the outside to secure the lids. The size of these hatches ranged from 31 x 78 inches up to 23 x 132 inches. 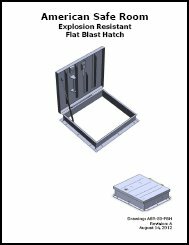 We used two of our blast door hinges per hatch. They feature oil impregnated bronze bushings and grease fittings for ongoing lubrication. The lids opened easily and there were no issues with binding despite the 11 foot length.